2015-01-11 - Updated Commons. Affects Scribbling Pad, DouglasVeiga Dancer Servcer, Moar Interactions and Buy Takeout. If you use any of them, download the updated version, please. 2014-03-15 - Updated to game version 1.67. 2012-11-18 - Compatible with 1.42. No changes. 2012-09-16 - Compatible with 1.38. No changes. 2012-07-16 - Compatible with 1.36. No changes. 2012-06-10 - Ensured compatibility with game version 1.34. 2012-03-12 - Updated to game version 1.32. 2012-03-02 - Updated to game version 1.31. 2012-02-12 . Removed an overzealous check that might be the cause for the "take out of inventory and put it right back" issue. 2011-12-15 - Updated to game version 1.29. 2011-10-19 - Updated to game version 1.26. 2011-07-26 - Updated to game version 1.24. 2011-06-05 - Copy&paste error in the tuning fixed. Skill gain and motive change are now worky again. 2011-06-02 - Updated to game version 1.22/2.16/3.12/4.9/5.7/6.4/7.2/8.0. 2011-02-13 - Properly flagged it for the "By Room" sorting in buymode. 2011-02-01 - Version header changed to current code version. No code changes were needed, thus classifying this update as facultative. 2011-01-24 - Added "Write Screenplay" interaction. 2010-12-01 - Version header changed to current patch version. No code changes. 2010-11-03 - Fixed an issue that caused the pad to be purged on world transition or household move via Edit Town. I'm not exactly happy with the fix as I had to remove all checks for the owner of the Scribbling Pad object in question. It couldn't be helped, though, because all EAxian methods to figure out the owner lot seem terribly unreliable. 2010-10-30 - Forgot to alter the ITUN resources when I applied the workaround for the LN-patch crashing issue. Tuning is now working again. Most notably, sims will gain writing skill from the practice/refine writing interaction again. 2010-10-29 - Updated to game version 1.17/2.12/3.8/4.5/5.2/6.0. Added missing catalog name and description for non-English games. Supported for game version 1.67. 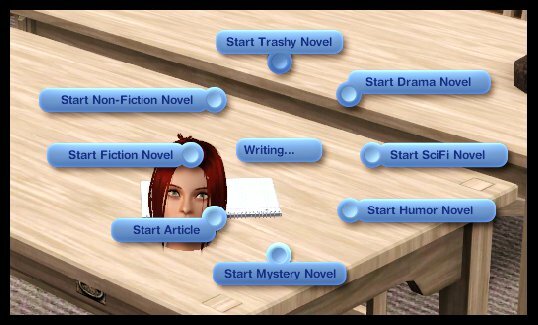 This handy little notepad gives your sims the ability to write novels, reports, etc. the old-fashioned way. You know, moving a thing called pen over a sheet thing called paper? It's way cheaper than a laptop, doesn't need a surface to be used and technophobes can use it without getting the heebie-jeebies. 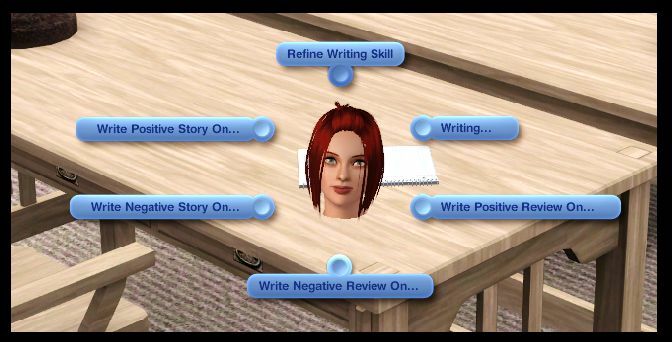 The completion of writing processes is a bit unrealistic, maybe even for the Sims, as the effects show instantly just the same as when using a computer. I thought about changing that behavior so the sim would need to mail the pamphlets first or something. Basically, that would have required coding alternative versions of all the writing processes and storing them in the pad which is a place where that data simply doesn't belong (it belongs to the skill and career data). I couldn't bring myself to accept that, and to be honest: The mod already took enough effort as it is. The scribbling pad is available for §20 in the buymode catalog under Entertainment -> Hobbies & Skills. That's where the chess tables are available. The interface and usage is basically the same as for the computer. Of course only the writing interactions are available. Not needed as I only used already localized strings. This is a scripting mod and as such the possibility for conflicts with other mods, no matter what kind, is next to non-existant. I can't think of any kind of mod which could possibly interfere with this mod. Follow the regular installation instructions for packages. Seriously, if you do that, the mod will be functional. If the mod doesn't work for you, you didn't follow the installation instructions. Don't ask me for installation help or don't be pissed if I simply show you the way to the Package Tutorial. It basically goes like this: Remove the package from your mods folder. But before you do that, please make sure that no sim is currently using a Scribbling Pad or you may become unable to load your savegame. I support my mods. I appreciate bug reports. I don't support mods or custom content in general. It's not an issue with a mod if it doesn't even show up in the game. Special thanks to orangemittens for helping me to figure out the animations stuff and tinting the pad black. Might lead to a serious case of squished brain. Your game should be safe, though. Use for rocket fuel. Don't use for stomach ailment.